I can’t speak for everyone but I know I love a good piece of clothing that is Disney inspired. Since I am not really a plain tee shirt and jeans kind of girl, I like it when that piece of clothing has a little extra something to it. Paul & Joe Sister must feel the same way because they have created a collection featuring the characters from The Aristocats! This collection has something for everyone. It is comprised of tees, sweatshirts, sweatpants (and for me) dresses! Let’s take a closer look at this collection. The dress seen above, is a light weight dress in a primarily gray and burgandy color with our fave Aristocat characters running amuck all over the fabric. This dress can be dressed up or down, as seen in the above photo, and could easily be mistaken for a non Disney print from a distance. I love surprising people with my Disney finds and this dress would fit that bill. It retails in the US for $195 and also comes in navy! Now, if you like to dress it down, there’s an option for you as well. This light gray sweatshirt is covered in frolicking Aristocat kittens. The sweatpants have a jaunty Toulouse on the leg. When it comes to price, this may be the dress down look but it is not in dress down prices. 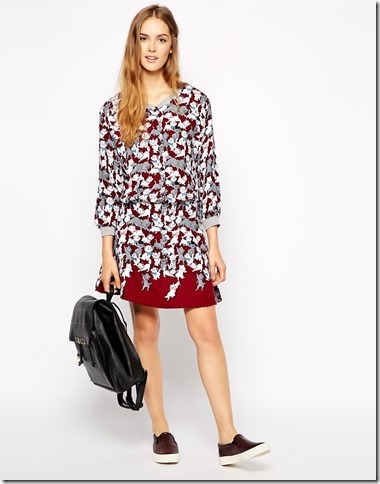 This is a designer line and these items are exclusive to ASOS…. this outift, on their website, costs over $550. This bonded jersey parka has an elasticated waistband and a hoodie. The waistband acts as a pathway for the cast of The Aristocats as they walk around the parka at waist level. It’s so subtle and yet so perfect. 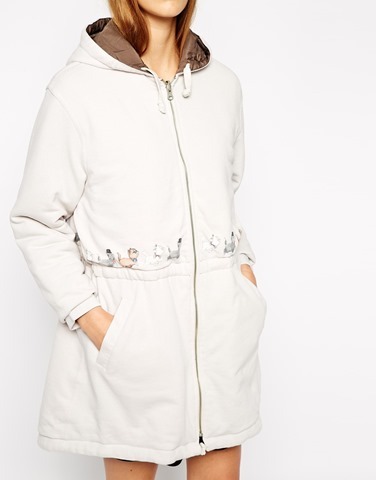 This parka is a pricey piece at $521 but, if you are an Aristocat fan, it’s a must have item… if you can afford it. These are just a few pieces of the Paul & Joe Sister x Disney exclusive for ASOS Collection. If you are interested in checking out the rest of the collection check out the ASOS website. Would you wear any pieces from this collection? Let me know what your faves are in the comment box below! Thanks to Disney Style Blog for the photos.